At the American Telemedicine Association conference in Chicago, clinicians came together to discuss how video-to-home technology can help deliver psychotherapy to veterans. Despite the fact that the Department of Veterans Affairs is the largest healthcare system in the country, for a lot of veterans coming into to a clinic, is difficult. It would be impossible for a clinic to be in every veteran’s neighborhood — that’s where telemedicine comes in. At the American Telemedicine Association conference in Chicago, clinicians came together to discuss how video-to-home technology can help deliver psychotherapy to veterans. But it turns out that distance isn’t the only hurdle in treating patients with living with mental health disorders. Terri Barrera, a research psychologist at the Department of Veterans Affairs, said that she works with patients with Obsessive-Compulsive Disorder. The condition causes patients to have recurrent unwanted thoughts as well as ritualistic behaviors, which the person feels drawn to complete in order to get rid of the thought, according to Barrera. Patients usually experience triggers, such as germs. All of this means that for some patients, coming into a hospital or clinic creates an extra layer of anxiety. But Barrera discussed how the “gold standard” of care can be implemented in video-based therapy. Currently, exposure therapy, where a client is exposed to the stimuli that is linked to the obsession or fear is introduced, is one of the main treatments, along with preventing the ritual. She discussed a case study involving a young female veteran who had a fear of blood, illness, dirt and germs. “With ‘Mary’ the hospitals were a huge trigger for her, so coming into the hospitals [wasn’t] an option for getting her the care she desperately needed,” Barrera said. Instead “Mary” was able to get the services she needed in her home with virtual based care. It also let her practice exposure therapy with stimuli that she faced every day. For example, she didn’t like to touch any mail that the mail person touched, so the therapist was able to walk her through this practical application, Barrera said. Remote therapy is also being used to help veterans who have experienced sexual trauma, whether that be in the form of assault or harassment. One in four women and one in 100 men who serve in the military experience some type of sexual trauma, according to Julianna Hogan, a psychologist and research health scientist at Baylor College of Medicine who works with veterans and presented during the session. Many of the veterans who have experienced the trauma aren’t in a place where they want to discuss the event, she said. But there are options for people who aren’t ready to revisit the experience but need tools for managing their symptoms. Hogan discussed a specific tool called webSTAIR, which is a self-guided platform where the user can work interpersonal relationships and coping strategies. Users of the tool can also add their therapist or coach. The goal is to eventually get people to a place where they can talk about their experience with a therapist. 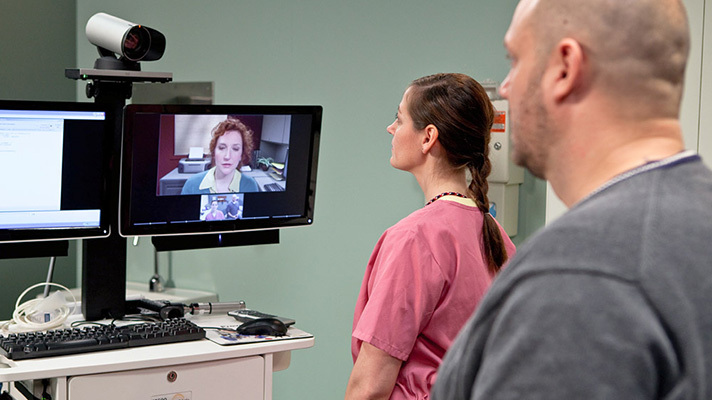 Addiction is another concentration where clinicians have tapped into telemedicine. Currently, Jan Lindsay, a psychologist at the Department of Veterans Affairs, uses telemedicine to treat people with addiction. Currently 11 percent of veterans who are receiving care at the VA have a substance abuse disorder; however, Lindsay said during the panel that this is a relatively conservative number. Lindsay went on to talk about a patient who was referred to her by the Veterans Justice Operation, after he was arrested. The patient was a combat veteran in his early 30s and had served in both Afghanistan and Iraq. She was able to meet with him over video in his home, but it was a multifaceted approach during which she worked with multiple providers on the case. This type of psychotherapy was also implemented for a woman who was living with homelessness. She was able to use a tablet at her shelter to attend therapy sessions for her addiction, after refusing to come in for treatment. While all of these therapies have given new avenues for patients to receive care, there are even more technologies coming out, the panel noted. But as more innovation come into the space, the clinicians said it was paramount that the therapies get tested and vetted on a veteran community.